sophie was awarded the Empiricism Barnstar by Shannon for their work in this research note. In Poweshiek County, Iowa, there are over 45 confined animal feeding operations, and due to their waste management strategies emissions from the manure, including hydrogen sulfide, often become airborne and reach people living in adjacent communities. The legal limit of hydrogen sulfide in Poweshiek County is 30 ppb for one hour up to seven times per year, and this summer a research group from the University of Iowa is monitoring H2S levels at nearby homes to determine whether levels are in fact within those permitted by the law. 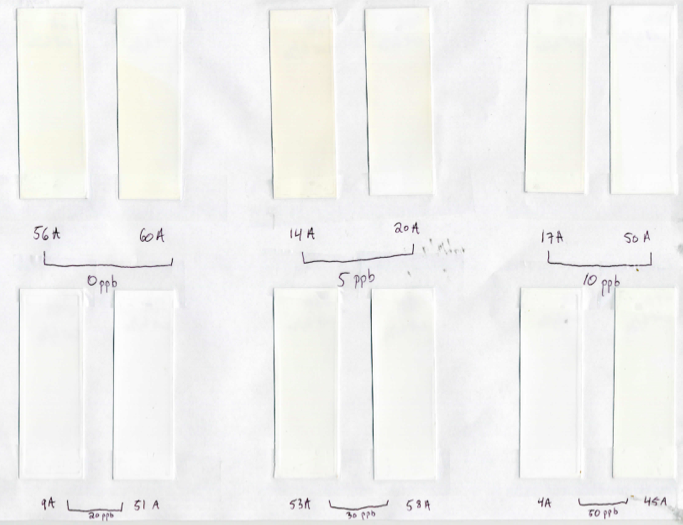 As a part of my contribution to this project, I am evaluating whether the DIY photographic paper method of H2S sampling originally designed by Claire Horwell et al. can be applied to CAFO emissions, specifically at levels at or below 30 ppb. I will deploy my samplers side-by-side with the conventional passive samplers in order to calibrate them. It is my hope that, if this method is successful, people living near CAFOs will be able to easily collect reliable data to find out whether they are at any risk from H2S exposure. I cut a hole the size of the lid of a film canister into the bottom of a 4"x4"x4" box. I designed a baffle template that folds into the box and is taped into place (photo is oriented so front face is on the left). It is cut out of black poster stock to minimize light in the box. Baffle is folded and taped into place with black duct tape. Rope caulk does a good job of filling cracks at the seams. The back corner can accommodate up to two samplers (best if taped into place). Light-proofed! Once the box is sealed shut with more black duct tape, only air can get to the samplers. As for rain-proofing, if I cannot place the boxes in sheltered areas I plan to cover them each with a plastic plate or bowl. I am currently doing a trial run to test whether the samplers can, under laboratory conditions, detect H2S levels at or below 30 ppm. I obtained 6 25-gallon emergency water storage bags and placed two treated photo paper strips in each (film canisters wouldn’t fit through the openings). Each bag was then filled with 0, 5, 10, 20, 30, or 50 ppb of H2S, shaking them every day to ensure even gas distribution. 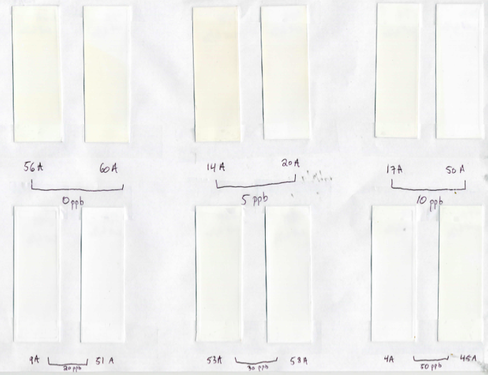 After two weeks, I retrieved and fixed the paper to determine if any darkening has occurred. The results seem to indicate that either this technique is not sensitive enough to detect such low levels of H2S, or that this method of testing was problematic (picture below). I'd like to think it was the latter, as the way the H2S was transferred to the bags could not have been perfectly airtight. It is also possible that despite using rubber stoppers and corks, some gas may have escaped out of the bag during shaking or even just while sitting under the hood. Finally, because the samplers were jostling around for two weeks, their coating may have worn off, or they could have rested face-down against the bag, which would have prevented H2S detection. A nearby hog farmer graciously allowed me to place three samplers in his confinement barn of 1,200 head. After two weeks, I retrieved two of the samplers, as well as one I set up outside my house in a residential area as a control. I found visible changes in the photo paper, but because the discoloration is cumulative over two weeks it does not indicate that the levels of H2S in the barn are any higher than normal. At this point, I can only confirm that this method shows promise with confined animal feeding operations. Control (left) and test (center and right) samplers after two weeks of exposure. The researchers at the University of Iowa are recruiting volunteers who live within one mile of a CAFO in Poweshiek County. I will deploy 40 of my samplers side-by-side with those of the University of Iowa (Sigma-Aldrich radiello radial diffusive samplers) at the homes of the recruits. Each box will contain one sampler from Batch A and one from Batch B, and will remain in place for 14 days, after which time I will retrieve and fix the samplers. 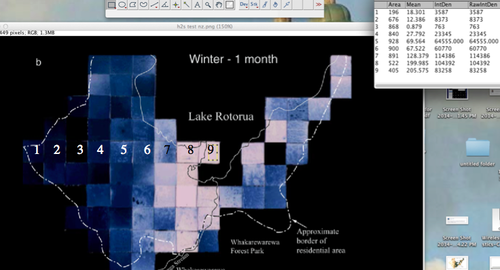 I tested out this method using an (inverted) image from Horwell et al. and was quite pleased with the result. Horwell, C.J., A.G. Allen, T.A. Mather, and J.E. Patterson. 2004. Evaluation of a novel passive sampling technique for monitoring volcanogenic hydrogen sulfide. J. Environ. Monit. 6: 630-635. Horwell, C.J., J.E. Patterson, J.A. Gamble, and A.G. Allen. 2005. Monitoring and mapping of hydrogen sulfide emissions across an active geothermal field: Rotorua, New Zealand. Journal of Volcanology and Geothermal Research 139: 259-269. Iowa Department of Natural Resources. 2004. Animal Feeding Operations Field Study. Appendix C: Iowa Administrative Code 567 Chapter 32. http://www.iowadnr.gov/Portals/idnr/uploads/air/environment/afo/appendix_c.pdf. Wow, this looks great; I really appreciate the emphasis on ease of construction and your careful water bag tests! @megan, @deepwinter, and others who've published on this kind of h2s detection will be thrilled. Thanks for all the positive feedback! I'm not sure where the bags originally came from, but they cost about $35 for five here: http://beprepared.com/basic-25-gallon-boxed-water-kit.html The concern I have with the technique is whether jostling the strips around freely within the bags will smear off their coating and affect their discoloration, but I'll find out in a week and post an update! Hi Sophie it just occurred to me that the Hydrogen Sulfide may have reacted with the metallic surface of the bag? Did you consider that? What were they made of? Hi, Sophie - did you get to do your follow-up tests? I'm curious what's happened since you published this! Thanks! Hey @sophie - it has been a while! Hope all is well. We're going to do an OpenHour on exploratory hydrogen sulfide monitoring methods Monday, January 8th at 8pm ET/ 7 central. Would be great to catch up!